SMOK Alien 220W TC Kit with TFV8 Baby Tank provides a high-powered platform that pushes the boundaries on size limitations for dual 18650 devices around the world. Combined with the critically acclaimed TFV8 Baby beast, the Alien 220W TC Kit is an ergonomic and visually appealing addition to a massive line of high-quality devices. The SMOK Alien 220W Starter Kit is constructed out of a lightweight zinc alloy, standing at 85mm tall and 44mm wide. The curved chassis offers a unique futuristic feel, providing an overall sleek look with complete ergonomic satisfaction. The front of the device features a brightly lit OLED screen display and two regulatory buttons, strategically positioned for complete ease of access no matter how the mod is held. The Alien mod utilizes Smok’s trademark firing bar, allowing the user to vape easily and comfortably. The battery door can be found at the bottom of the device and houses two 18650 batteries (not included). This device can be upgraded and/or charged via MicroUSB port on the front. The Baby Beast is a high-powered 3mL top-filling tank that flexes impressive muscles despite its small size. SMOK Alien Vape Kit includes a dual-coil 0.4 ohm Kanthal atomizer head (pre-installed) for the flavor chasers, as well as an octuple-coil 0.15 ohm Kanthal atomizer head for the cloud chasers out there. Each Smok coil head is wicked with pure organic cotton, creating that award-winning flavor that Smok is known and loved for. 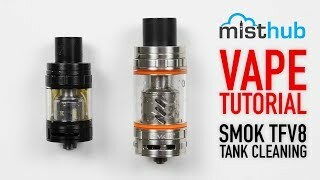 If you’re looking for a similar device checkout SMOK ProColor Kit With TFV8 Big Baby Tank, Smok’s latest Alien 220W TC kit proves to be a worthy contender. The Alien Vape Kit offers an impressive amount of power with its turbo-charged 220W Alien Mod coupled with the sleek TFV8 Baby Beast sub-ohm tank. This brilliant combination of high-powered hardware is one of Smok’s most compact and pocket-friendly kits released to date. Inside the box, SMOK Alien Kit includes a limited warranty card, a MicroUSB cable for fast charging and firmware upgrades, orange and black vape bands, a replacement .15 ohm octuple atomizer head and some spare glass for the TFV8 Baby Beast. The Alien Box Mod is a slim, 220W capable, dual 18650 Temperature Control device. The Alien is constructed out of Zinc Alloy and measures in at an impressive 85mm tall and is only 44mm wide. At the top of the mod is a stainless threaded 510 connection that houses a spring loaded contact pin. The right side of the Alien Vape features an extremely responsive firing bar that’s quite unlike any of Smok’s other devices. The Alien’s firing bar is tight and produces a satisfying click when pressed, unlike the H-Priv or the X-Cube series of devices. On the back of the mod is a carbon fiber design that features Smok’s Alien branding, and on the front of the device is a large OLED screen display, two regulatory buttons and a conveniently placed MicroUSB port. The bottom of the Alien features a sliding battery door that houses two 18650 batteries and uses 24k Gold plated battery terminals for increased conductivity. With the device powered on, the large OLED screen displays the current wattage, draw strength, battery life indicator, voltage, resistance, amperage, vape mode, board temperature, puff counter and vape duration counter. Three clicks of the fire bar takes you into the main menu. Here you can enable temperature control mode, access your puff counter, alter the OLED display brightness/sleep timer or power the device off. 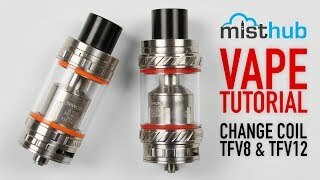 The TFV8 Baby Beast is a powerful sub-ohm tank that’s constructed out of stainless steel and Pyrex glass, standing at 53mm tall and 22mm wide. This 3mL tank uses Smok’s notorious top-fill swivel cap for fast and painless filling, and features a removable heat-resistant 510 Delrin drip tip. At the base of the tank is a free-spinning dual adjustable air-flow with two 13x2mm air-slots and a threaded 510 connection. Pre-installed inside the Baby Beast is an impressive .4 ohm V8-Q2 coil head that’s rated at 40-80 watts, with a suggested best use between 55-65 watts. The V8-Q2 atomizer head features a dual vertical kanthal coil configuration, wicked with pure organic cotton and constructed with four large wicking ports for fast, rapid-paced wicking. Altogether, SMOK Alien Kit provides immense power despite its small size. When compared to JoyeTechs critically acclaimed 150W Cuboid, the Alien is 6.5mm shorter and just 2mm wider. The new-and-improved firing bar provides that tactical feeling of being pushed, letting out a satisfying click to let you know that the device is being fired. 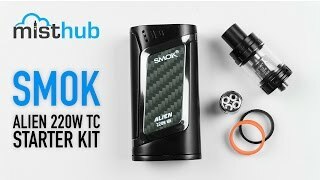 If you’re looking for a new, all-in-one kit that offers some of the best technology on the market today, Smok’s latest Alien Kit will not disappoint. 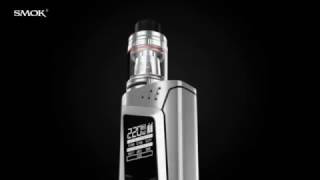 Be should to check out great SMOK Alien 220W reviews by fellow shoppers. Please make sure you complete STEP 1 and find corresponding firmware version before proceeding to the next steps. Versions A and B are NOT cross compatible or universal.